What were your best travel photos in the first half of the year 2018? Michael from Erkunde die Welt dedicated himself to this question, but also asked other bloggers to participate in the seventh “Fotoparade” to share their photos. I’m more than happy to join this year as well. On my last journey at the beginning of this year I went to Brazil. I was interested in this country especially because of its biodiversity. By all means I was definitely not disappointed and I went home with thousands of photos that now wait to be published. As I dedicate myself at the moment especially to animial photography and as we are on a blog about wildlife, I show exclusively photographs of wild animals. From the six categories of the “Fotoparade” I choose the two categories “close-up” and “best photo” (although the “best photo” is a “close-up” as well). As I was mainly in search of non-human primates, I will show photographs of only this animal group. The term “non-human” might sound a little bit complicated and inconvenient for you. However, I like to use this term, as we humans are primates, too. Furthermore, this term is quite common in primatology. I saw the crested capuchin in the Reserva Natural Vale close to Linhares in the state of Espírito Santo in Brazil. That means, in the East of Brazil close to the Atlantic Ocean. The Reserva Natural Vale was an insider tip of a Brazilian and was actually not on our itinerary. However, the Reserva Natural Vale is abundant in biodiversity and is an UNESCO World Heritage natural site. 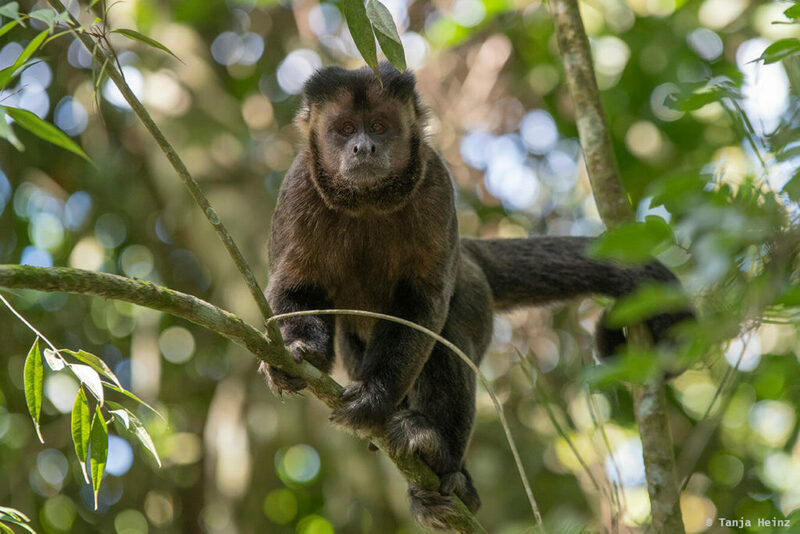 When Ricardo (who is Brazilian by the way) and me went to the Reserva Natural Vale, we did not expect to see crested capuchins or any other animals. We were late and it was a very hot day. We thought most animals probably hide and relax from the heat. When I saw and heard a yellow-throated woodpecker (Piculus flavigula) drumming I became hopeful to see some more animals on that day. However, mosquitos were biting us all the time. And thus, we left the area of the Atlantic Forest in the Reserva Natural Vela to get rid of the mosquitos – at least for some time. As there was a small timber roof on stilts we went there to protect ourselves some time from the hot sun… until we heard something in the top of the trees. There was a group of crested capuchins moving through the forest. The crested capuchins were jumping from tree to tree and I followed them with my camera until they stopped at a tree with an open jackfruit. 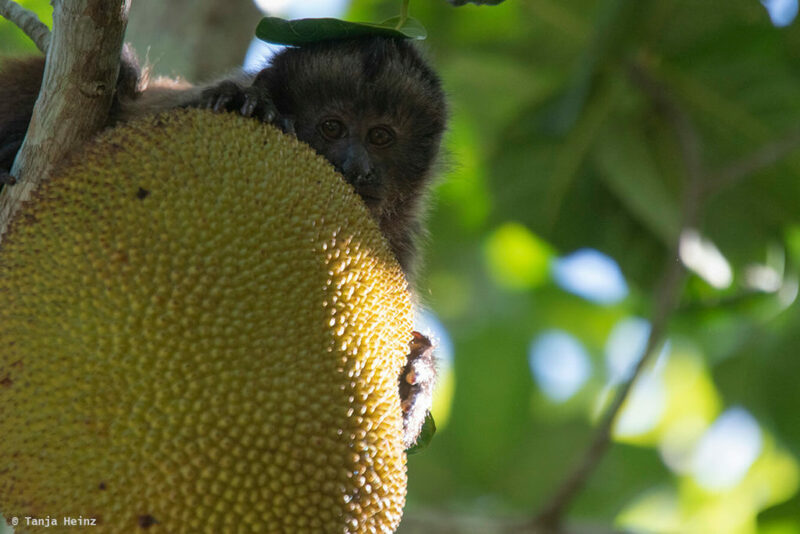 The younger crested capuchins reached first the jackfruit and got their share of the fruit. However, when a bigger crested capuchin arrived, the other individuals left and cleared the way for him. I think that this bigger individual might have been the alpha male of this group. One crested capuchin hid behind a big jackfruit and I thought that this one is a great photo motif. I could have watched the crested capuchins for hours, however, as it became later and later, eventually we had to leave again. In Brazil it is sometimes very helpful if you know some Portuguese or if you travel with a Brazilian. When we stopped at Vitória – the capital of the state Espírito Santo and likewise located in the East of Brazil – we got another great insider tip of a Brazilian. She recommended us to walk up the forest on the Morro da Penha where the Convento da Penha (translation: convent Penha) is located as in this area live small marmosets. Indeed. 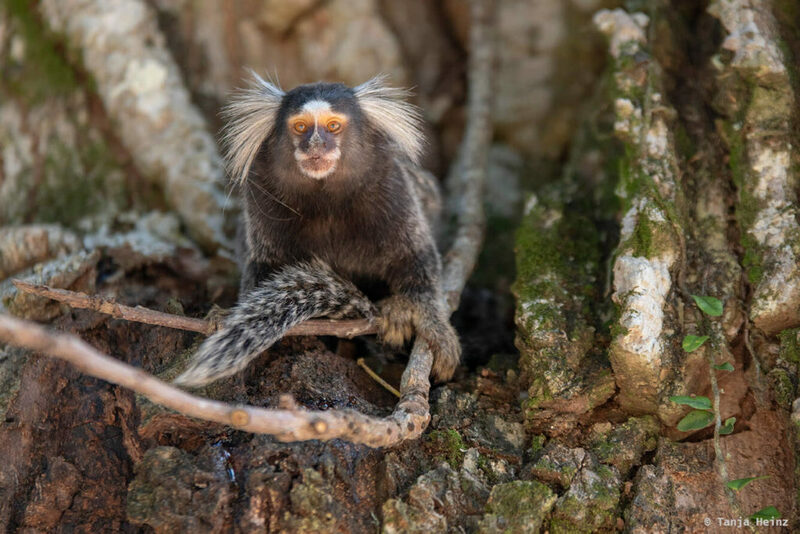 When we walked up the Santuário da Natureza (translation: natural reserve) of the Morro da Penha we did not see any marmosets, but after enjoying the view from the Convento da Penha over the city of Vitória we spotted some White-headed marmosets at the entrance of the convent. We watched them how they gnaw the bark of the trees. They did not appear shy at all to us and the other visitors. They appeared quite indifferent to the people around. They just continued with their life like they probably do every day. The „Cidade Maravilhosa“ (übersetzt: Marvelous City) – how Rio de Janeiro is known – has to offer not only samba, soccer or Copacapana, but also wildlife. Like for example the common marmosets. 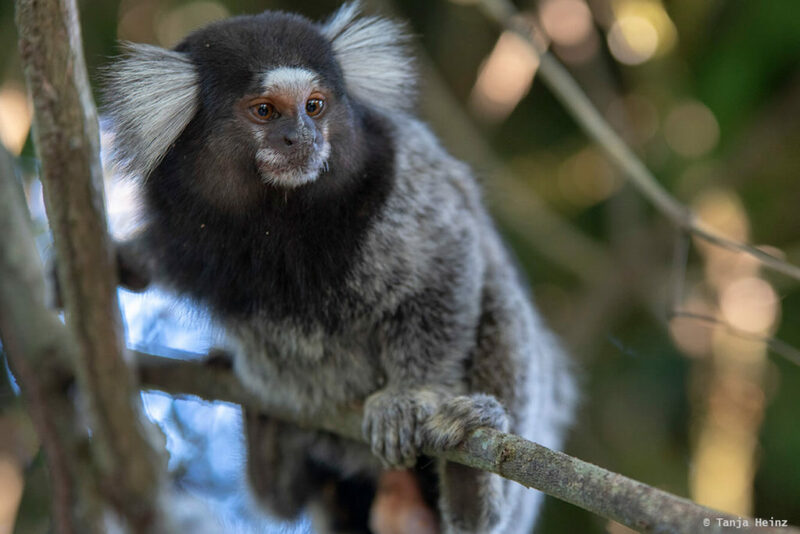 If you go from the Praia Vermelha into the direction of the Pista Cláudio Coutinho at the Sugarloaf, there is a good probability to see wild common marmosets. The Pista Cláudio Coutinho is an asphalted walkway of about 2 km distance. As the walkway is surrounded by dense trees you can go for a walk in the shadow of the sun. There is also a walkway up to the Morro da Urca where you have a great view over the city. When we walked through the Pista Cláudio Coutinho we saw common marmosets more than once. They are not shy, but they also do not care about the people around them. It was not very easy to take photographs of them as these animals move very quickly. However, this was a very welcome challenge for me. While the sun was very strong at the beginning when we entered the walkway, later on the day the light became less strong and warmer. Thus, in the late afternoon I got this picture. They actually look quite cute, however, they are not very popular among conservationist as they are not native to the forests of Rio de Janeiro. They rob eggs from native birds and compete for food with other native animals. 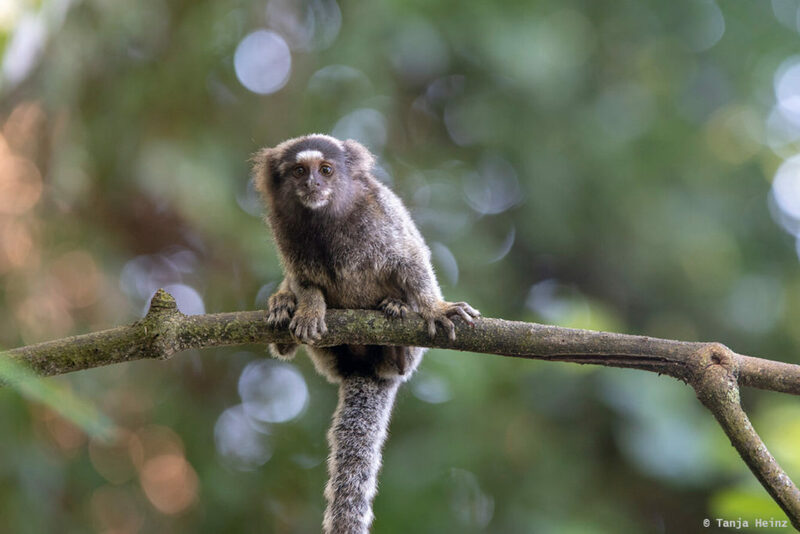 In Rio de Janeiro there are actually many places where you can see common marmosets. One other place is the Botanical Garden of Rio de Janeiro. Common marmosets apparently are very well adapted to human settlements as they are so common. In the Botanical Gardens of Rio de Janeiro I was actually on the search for black-pencilled marmoset (Callithrix penicillata). I was not successful with this, but we saw again some common marmosets. One very special experience on my journey to Brazil was our visit of the Associação Mico-Leão-Dourado (AMLD) in Silva Jardim in the state Rio de Janeiro because in this area of the Atlantic Forest live golden lion tamarins. This experience was so special as golden lion tamarins are an endangered primate species. The IUCN lists the golden lion tamarins in the category “endangered”. In Silva Jardim we met a group of very committed people who put all their efforts and passion to the protection of the golden lion tamarins. Every day they control populations of golden lion tamarins. They are also involved in reforestation projects to close fragments of habitats so that golden lion tamarin populations can exchange genetically. When golden lion tamarin habitats are separated through streets, they cannot meet with each other. During my stay at the Associação Mico-Leão-Dourado I learned a lot about the golden lion tamarin. I think exactly this is responsible tourism. As the guides control the populations every day, they have a big knowledge about these animals. I think many more people should know about this great project of the Associação Mico-Leão-Dourado. Therefore, you will read much more about these wonderful animals in the future on this blog. When I was in Silva Jardim at the Associação Mico-Leão-Dourado I wished to see the golden lion tamarin. However, in the Itatiaia National Park I was not on search for a specific non-human primate species. As the Itatiaia National Park is popular especially among bird observers I expected to see many, many colorful birds. Therefore, we participated at a bird excursion. I was impressed by the bird diversity in the Itatiaia National Park. However, when I heard that capuchins live in the national park as well I was continuously looking for them in the trees as well. At the end we did not spot them in the trees, but at the side of a gravel road as there was sitting comfortably one black capuchin. While one individual was sitting at the side of the gravel road, other individuals were sitting or climbing the trees. We were almost alone with the black capuchins. Only some Brazilians passed and stopped for a moment to take some pictures. We met some black capuchins later again on our journey. And that was on the Argentinian site of the Foz de Iguazú. However, there was a big difference in the behavior of the animals. At the Foz de Iguazú (in april) there were many more people than at the Itatiaia National Park (in March). Correspondingly, the black capuchin groups had a quite different behavior. 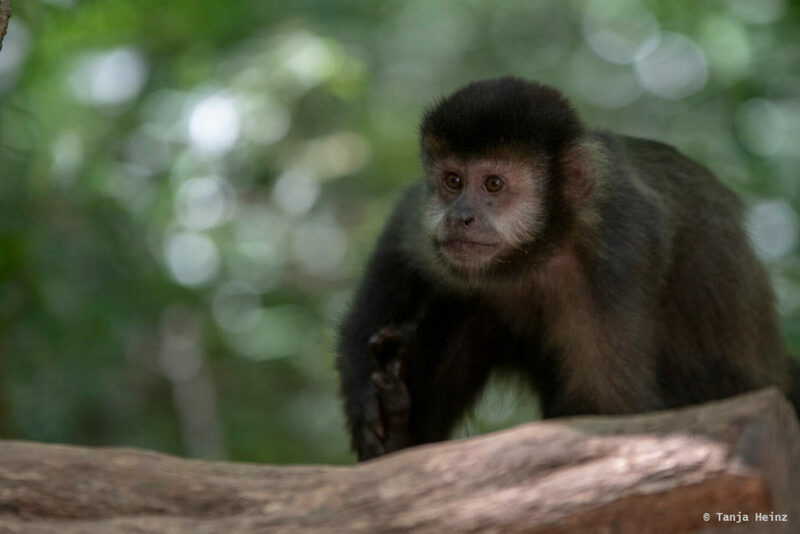 While the black capuchins kept their distance in the Itatiaia National Park, the animals at the Foz de Iguazú came quite close begging for food. Unfortunately we had to observe how black capuchins were robbing hamburgers and how a woman was feeding the animals with biscuits (although you can read everywhere that this is not allowed). Another great experience in Brazil for me was observing Southern muriquis in the Parque Estadual Carlos Botelho. As I was not successful searching for Northern muriquis (Brachyteles hypoxanthus) in the Feliciano Miguel Abdala Nature Reserve, I was very happy to have found the Associação Pró-Muriqui where I could join for one day a group of committed conservationists in the forests of the Parque Estadual Carlos Botelho. It is difficult to describe my experience. It was just wonderful to sit or stand in the forest and observe the animals. 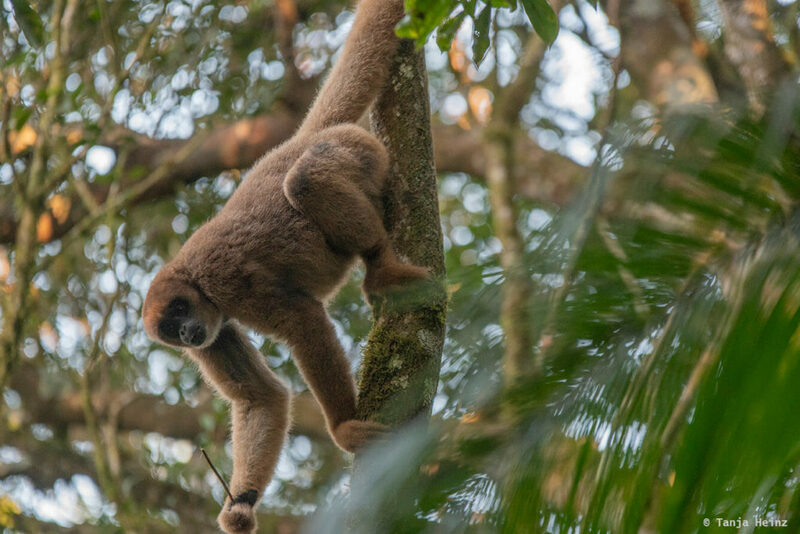 While the Southern muriqui is “endangered” according to the IUCN, the Northern muriquis are even “critically endangered”. Unfortunately many people do not know the muriquis. Because of that you will hear much more about these animals again on this blog. 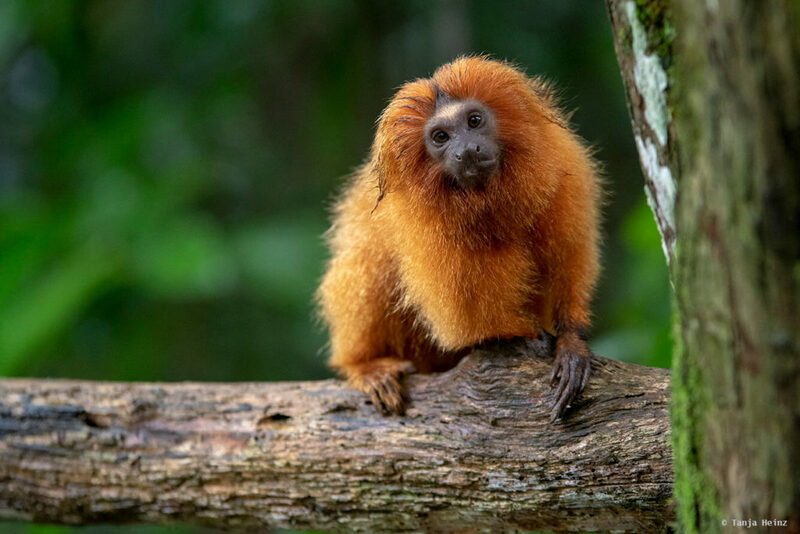 My favourite non-human primates in Brazil are the golden lion tamarins and the Southern muriquis. However, as I cannot decide between them and as it was quite difficult to get a high quality photograph of the muriquis I decided to choose a young of the common marmosets as best photograph. 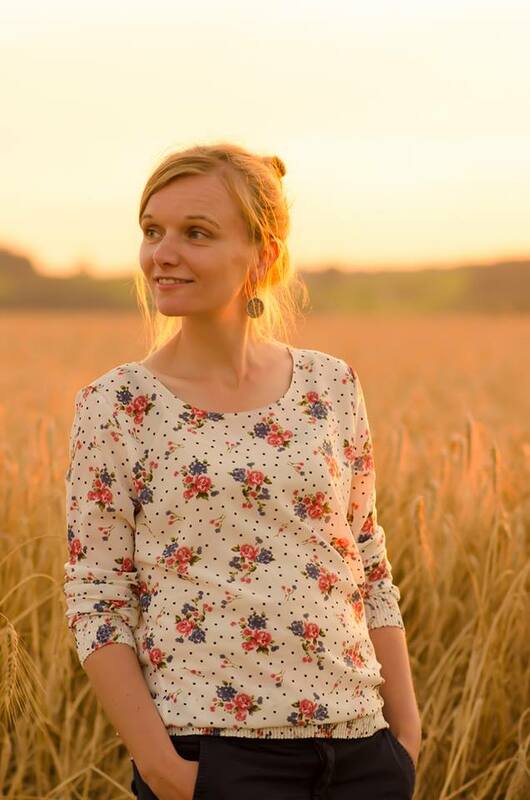 I have chosen this photograph because I like how this young looks into the camera and how it was possible for me to blur the background. 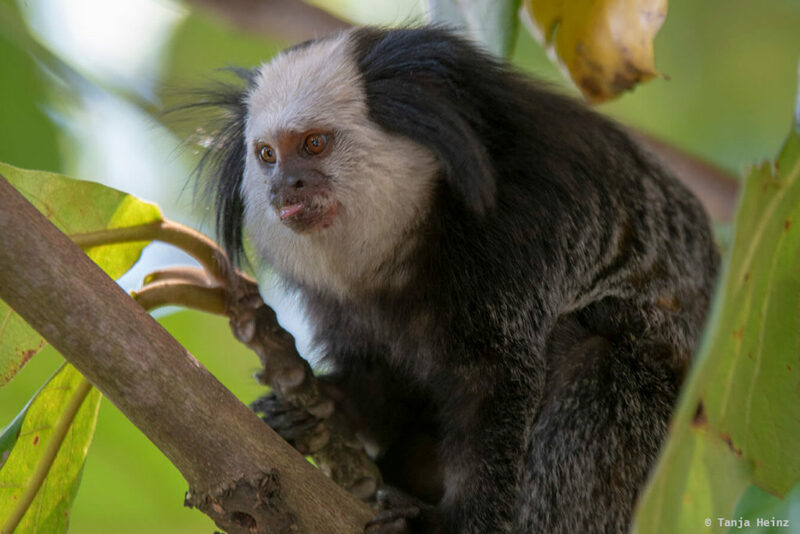 This common marmoset young lives at the Sugarloaf in Rio de Janeiro.